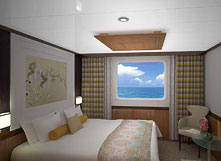 In December 2012, a second luxury ship, The Moana, will begin sailing under the Paul Gauguin Cruises banner. Scheduled to undergo a multifaceted renovation to be completed that month, The Moana will accommodate just 90 guests and will reflect the high standard of quality and service already established for the cruise line by the m/s Paul Gauguin. The Moana specializes in European, Caribbean, and Latin American destinations, with an emphasis on delivering unique itineraries that larger ships cannot offer and exploring hidden ports throughout these regions. Spacious staterooms, an onboard watersports marina, a choice of two open-seating venues, and extensive spa are among her luxurious attributes. There is simply no better way to experience Europe, the Caribbean, or Latin America than aboard this sleek and sophisticated, intimate ship. All staterooms feature an ocean view, temperature control, queen-size bed (all have twin-bed configuration), bathroom with full-size shower, bathrobes, slippers, hair dryer, TV, CD/DVD player, personal safe, refrigerator stocked with soft drinks, and more. Select staterooms can accommodate three guests. Owned by Pacific Beachcomber S.C., the leader in French Polynesia luxury destination resorts, Paul Gauguin Cruises operates the award-winning luxury cruise ship m/s Paul Gauguin, providing a luxury cruise experience tailored to the unparalleled wonders of Tahiti, French Polynesia and the South Pacific. Paul Gauguin Cruises is committed to providing an unequalled luxury cruise experience uniquely tailored to the unparalleled wonders of Tahiti, French Polynesia and the South Pacific. Our numerous World's Best awards demonstrate our dedication to guest satisfaction, excellence, quality and value. Paul Gauguin Cruises operates the m/s Paul Gauguin, the renowned, award-winning, 5-star-plus, luxury cruise ship built specifically to sail the waters of Tahiti, French Polynesia and the South Pacific. Since its maiden voyage in 1998, the m/s Paul Gauguin has been the longest continually operating year-round luxury cruise ship in the South Pacific. No other luxury ship in history has offered this level of single-destination focus and expertise on a year-round basis for such an extended period of time. With over 25 years of experience in the French Polynesian tourism market, Pacific Beachcomber is the country's largest luxury hotel and cruise operator in the region. In addition to the m/s Paul Gauguin luxury cruise vessel, Pacific Beachcomber operates five award winning hotels. Sustainable development is the keynote of Pacific Beachcomber's projects, whose resorts are all Green Globe certified. Pacific Beachcomber is also currently developing a luxury eco-resort, The Brando, located on the actor's private island and slated to open in 2012.